All the ladies in my family have a thing for stripes. Chances are one of us, if not all, will be wearing stripes on any given day. So when my daughter wanted a new quilt for her bedroom, I was pretty sure her design would include stripes. We had a great time designing this quilt–Betty chose the colors, selected the fabrics, and sketched her plan. The quilt is made of strips that I made longer than needed so we could play around with the lengths and order of the colored stripes. A process declared to be surprisingly fun! I really like how the simplicity of the design showcases the prints, and the balance of bold and subtle patterns makes the quilt lively without being too busy. Nice work, Betty! Betty may not have an interest in sewing (yet!) but she so far she is my favorite client. Here is a peek at the Icy Peach backing and the Melon binding. I especially love that Melon, and am very glad I got some extra. 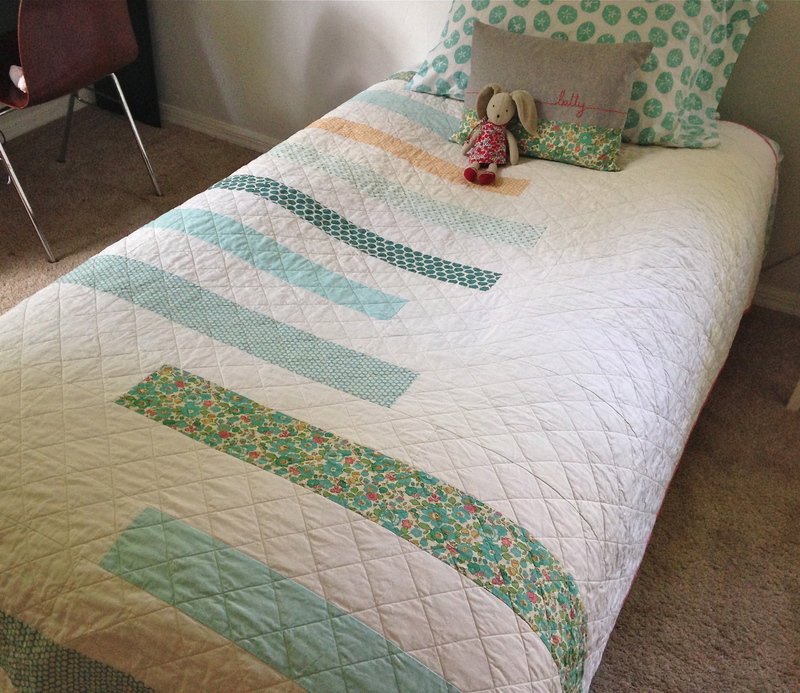 This entry was posted in kids stuff, quilts and tagged aqua quilt, kids quilts, simple modern quilt, striped quilt, twin size quilt on August 20, 2014 by brigitdermott. I LOVE sweet & simple – congrats – wonderful job! Sweet and simple, it’s perfect! Lovely! I just love the simplicity of your quilt, peaceful and beautiful! 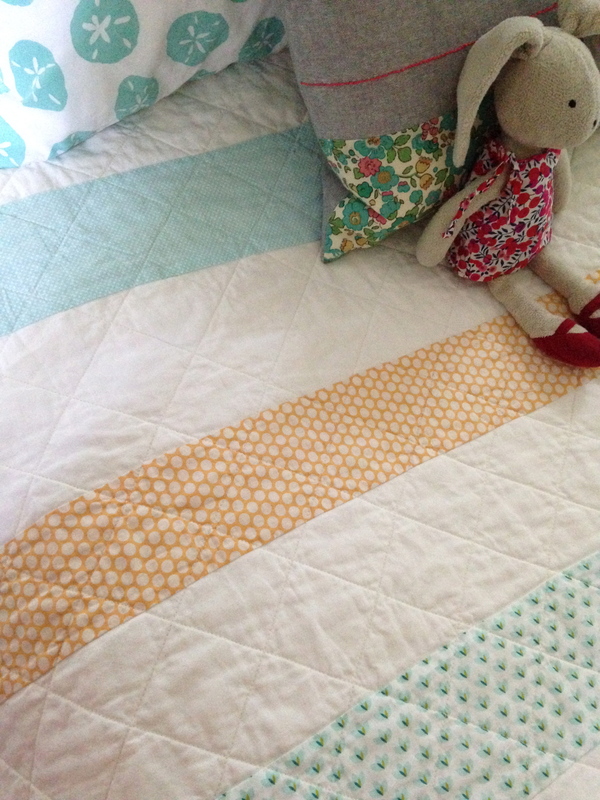 Love it … I too like stripe quilts .. fast to piece and easy to showcase beautiful fabrics! This looks so wonderful! How fun to work with your daughter to create it, too. This is some kind of wonderful! Betty has great taste. 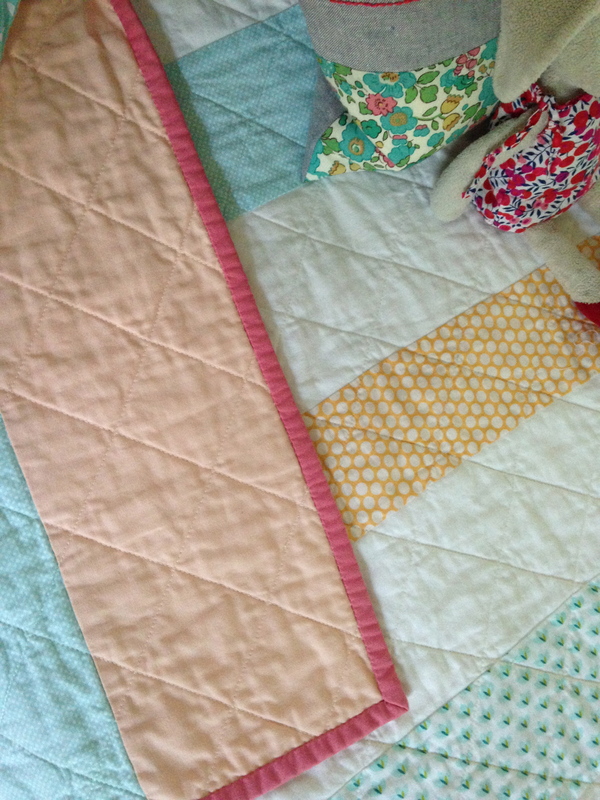 I’m often surprised and delighted at how much I love simple quilts. Thanks, Melanie! Simple quilts are always my favorite!